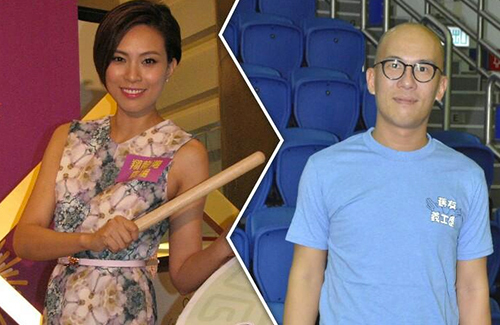 Queenie Chu (朱慧敏) is finally calling it quits. The Come Home Love <愛·回家> actress confirmed on Sunday that she has finally broken up with longtime boyfriend Eddie Pang (彭懷安), who was caught in a cheating scandal after he was photographed spending the night at another woman’s home. Queenie and the former EO2 member announced their engagement in February 2015. The couple had dated for three years previously and invested on several businesses together. Earlier this summer, Eddie was seen behaving intimately with another woman, but Queenie defended her then-fiancé, expressing that she believed in Eddie’s character. Eddie also issued a public apology to Queenie. After months of being apart and reflecting on their relationship, Queenie and Eddie has finally decided to call it quits. Queenie confirmed their breakup at an event she attended for Mid-Autumn Festival on September 27. Although they are now both single, Queenie stressed that they still have good feelings for each other and are friends. They do keep in contact, but only for business purposes. Last month, Queenie and Eddie were photographed walking into a store together, but Queenie said they were visiting a mutual friend at the time. Queenie then gave Eddie her blessings, wishing him a happy Mid-Autumn Festival and to quickly find a new girlfriend. What the heck has happened to Eddie Peng? Why has he turned into a “dork”? LOL!!!! It was coming the moment he was caught kissing another girl after their engagement. I am glad that Queenie had handled this in a mature way. Good luck to her for the future. Yea good luck to her. Can’t help but remember how she was the third party in Joey Leung and Margaret Chung’s relationship. That is not to say this is karma, just wonder how she feels having the tables turn on her. No one deserves to be cheated on. I think she’s a decent actress and she redeemed herself after that incident but it’s still a thought that came up in my head lol. This Come Home star was a 3rd party? Whhooooooo…WOW, imagine that. I thought she was quite ok looking among those TVB stars now but no idea on her love life history. Always find it odd that she’s even dating this dude. I mean he looks weird and apart from seeing him a while back from those super trio show I don’t even know what they do exactly. lol…I only remember her from some episodes of come home love comedy series. But that’s a good way to handle a cheater thou, I mean what’s the point you know if you no longer trust that individual but some people just hang on and on…. @kiki Yup. Never expect a relationship with someone that cheated before. They’ll do the same to you. Life lesson 101. She was destined to be Come Home Love star but got dropped when she had diva attitude. Seems like she takes everything in life for granted. Yes karma came back and bite her in the back. Just glad she handle it well. Wishing her the best.